The Auto Market is HUGE! In the US there are over 21,000 new car dealerships and over 50,000 used car dealerships! That represents 50 million vehicles each year. Every vehicle will be sold once as a new vehicle but 3 times as a used vehicle. on their lots. The average dealership turns over its inventory every 56 days! Dealers Spend Money to sell cars! According to NIADA the average dealership spends $426 to get a pre-owned car ready to sell. They then spend an additional $375 in advertising to bring ONE customer to the store! Only 5% of Dealerships make their own used car window stickers. About 5% make their own stickers. 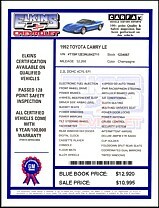 Most dealers are too busy and they would prefer to pay an outside vendor $6 to $10 per vehicle for the sticker service. Fees can exceed $20 per vehicle for window stickers plus digital photos and Internet services. Every week there are more cars that need service at every dealership. We do have an in-house version of our product that can be used by those few dealerships that want to print their own stickers. All NEW cars have window stickers! Window stickers have been used to sell new cars for over 75 years. All factory-certified used cars have custom window stickers. Why? Because they make money and provide customer service! Federal Law requires a sticker. An FTC Buyers Guide is required by federal and state laws. 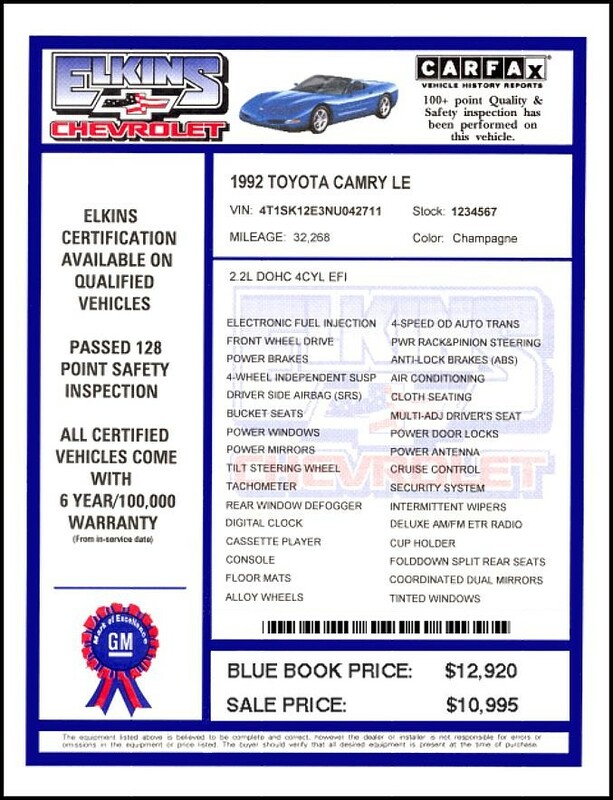 AutoPlus software prints these stickers with up to 7 unique warranty choices for each dealership! AutoPlus Window Stickers Sell Cars! AutoPlus Window Stickers make buying a used car easier for the buyer and more profitable for the dealership! Window Stickers sell cars 24-HOURS-A-DAY! AutoPlus Window Stickers give a NEW CAR look! Proven Concept Millions of AutoPlus Window Stickers have been sold because they work! Over 4,000 custom forms. AutoPlus has over 16 years in the window sticker business! We just keep getting better. This is not a franchise or business opportunity. You have control and save money! Upload Data to the Internet and the Dealership's Web Site. AutoPlus makes it easy to put a dealer's inventory on the Internet. You can offer a live, searchable inventory service for the dealerships own web site. Just click the mouse. This can increase your fees to $12 to $20+ per vehicle! We have a variety of export formats so you can send data to Ebay, Autotrader.com, Cars.com, Cobalt, Automark and other services. You can even own and operate your own regional Internet AutoMall with AutoPlus! You can use the AutoPlus Data Distribution Service and have us automatically send your vehicle inventory and photos to Autotrader.com, Cars.com and other web services. AutoPlus Inventory Survey Service Use our smartphone Apps and AutoPlus Express software to provide a monthly inventory survey for car dealerships. A fast and accurate way for dealerships to verify and reconcile their monthly inventory for floor plan. This is a fast, time-saving service for both New and Used car inventories! No Franchise Fees or Rules! We act as your supplier and tech support. We never dictate your business practice and we would never tie you up with a restrictive franchise contract! We do not charge a franchise fee! Some other companies charge you from $.60, $1.30 up to $4.95 per vehicle for VIN decoding plus charge you for the window sticker form sets and $195 per month or $495 per year! Some companies charge you $795 each year for new software. Some companies charge you $300 each year for a VIN decoding add-on software. Some companies charge you extra for shipping. Some other companies require that you must be connected to the Internet to use their software. Some companies require that you send them all of your data. Some companies tell you what you can do, what you cannot do, and what you must do.